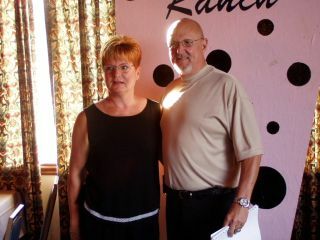 Ron with wife Marsha at the 40th reunion. After military service on the island of Okinawa,I returned and worked with my father's company until I was hired by the Speedway to be a track photographer in 1972. In 1977 I took over the Photo Dept. of IMS as director and have been there ever since. I have been fortunate to win several awards in racing for my photography including induction into the Motor Sport Photography Hall of Fame in 1988,Rolex Motor Sports Man of the Year award in 1988,several USAC recognition awards,Creativity awards and 2002 ,the Andy Granatelli "Unsung Hero" award at the Indianapolis 500. Through my career in auto racing photography, I have had directorships at Michigan International Speedway,Nazareth(PA) Intl Raceway,USGP/Detroit,USGP/Dallas,Denver Gran Prix,Queensland(Australia) Indy Grand Prix,Budweiser Grand Prix of Cleveland and have traveled extensively during my 30 years in the business. I retired from the Indianapolis Motor Speedway in September of 2011. I am 1st Vice President of the Indianapolis 500 Oldtimer's Association and will become its President for a 2 year term in January 2014. May 23rd, 2013, I received the "Louis Meter Award for Lifetime Achievement at the Hall of Fame Banquet in Indianapolis. It is an award named after the 1st Indy 500 3 Time winner and has been won by the like of AJ Foyt, Tom Carnegie, Rick Mears, Tony George, Roger Penske and Al Unser Sr to name a few. I was very honored to receive this prestigious award!